You know how sometimes moments that make up a day seem to flow naturally forward? This morning was one of those days. Now you're probably thinking I painted something new, or had a productive day, but I can't say I did either of those scenarios. 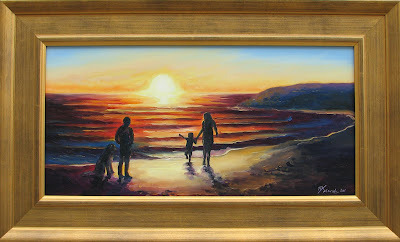 But I did go visit the lovely family who commissioned me to paint this 12"x24" oil on canvas of the three children. I named it Golden Shore (based on Lawrencetown Beach, Nova Scotia). Then I visited a nearby gallery in Hammonds Plains called Swoon Fine Art. And swoon I did, over all the gorgeous artwork, antiques, and pottery. I especially loved Louise Baker's paintings. The photos of her work don't do it justice. A few minutes down the road from here I stopped to visit my old friends, the director and her daughter, at Bedford Academy, where I used to teach art to P-8 every Friday for a school year. We made a date for a drink when we can relax and catch up. It was lunch time and the kids were really running around and letting some energy loose. I miss that place so much! I hope to do it again some day. My only downfall is that I get way too attached to the kids. But how could you not? They're so bright, and adorable, and those uniforms! Last stop, Pete's Frootique. I haven't drooled over this place in years, not since I used to drive out to Bedford when I was teaching years ago. Seriously, the food choices and fresh produce here are absolutely amazing. At the checkout the lady said, "You've got some really interesting choices. You must be a great cook!" Oh if only my husband could have been there to hear that! His mom, on the other hand, cooks like an Italian chef. She did marry one after all. She just called a moment ago. Tonight my husband's bringing home a roast pork dinner, straight out of the oven! What a lovely day. I can't wait for you to smell the soft air in Hawaii... it's like I'm visiting vicariously through you. Louise's work is beautiful. Say hi to the ocean for me this evening!